Whenever the impending rains approach Olympic National Park, they turn our hills and valleys back into the spectrum of green that makes home feel like home. For some of us, that means misty morning walks up our favorite mountains (like Mt. Ellinor), for others, that means relaxing indoors with a good book, but for those of us that feel best while we are two-wheeling, that means tacky dirt and flowy mountain biking trails! Grab your elbow pads and helmets, and tune up your metal steeds as we embark on our newest in the Hood Canal Travel guide. Serious riders (or pure-and-simple fun-seekers like us) need a belly full of goodness to fuel a full day of thrill-seeking. If you’re an early bird and a breakfast fiend, stop into Blondie’s for down home from-scratch diner food. The biscuits and gravy take the cake at this friendly local joint. After meandering down some forest roads underneath the towering Olympics, come to the Lower South Fork Skokomish River Trail #873. Characterized by its intermediate single track riding through some of the finest ancient forests in the Northwest, this ride serves up a bit of everything. Doable as a 20.9 mile loop, if you care to climb the road and ride trail down although most prefer to ride single track up the trail and then back down. Olympic elk still roam the hillsides, and as you are slashing short, quick ascents and sending sometimes rocky and rooted descents, take in the uncontested beauty of the river valley sliced by the surging Skokomish River. Before embarking, be sure to check trail conditions here, and prepare to be without cell service by having a good map and a USFS Rec Guide. Keep in mind that, like most USFS land, a Recreation Pass is required, which you can find here, or at a number of local businesses like Verle’s Sports Center and Marine in Shelton. Before that plastered grin that characterizes a good ride fades away, get yourself to one of the most recognized historical relics of Hood Canal. From the trailhead, a short 20 minute drive takes you to the High Steel Bridge. 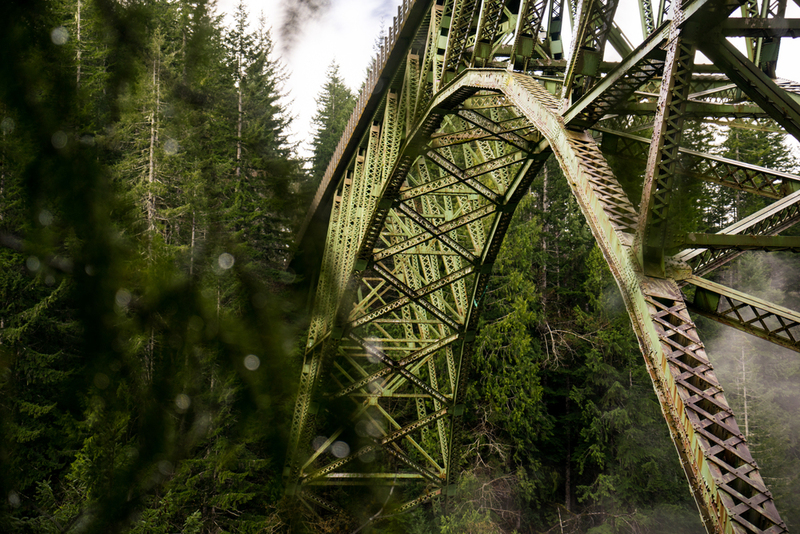 The highest railway arch ever built in the United States spans the South Fork of the Skokomish (a river that you are already quite familiar with) a dizzying 365 feet above the forest floor. Originally constructed in 1929 by the Simpson Logging Company, the bridge was converted to road use in 1950. As you flip through the memories of a day well spent, remember that we love keeping up with you! Tag your photos and thoughts on social media with #explorehoodcanal #wildsideWA #hoodcanal. Be sure to check in with us on Facebook, Twitter, Instagram, and Pinterest for more ideas on how to get the most out of your road trip to Hood Canal. Happy trails and happy tasting!